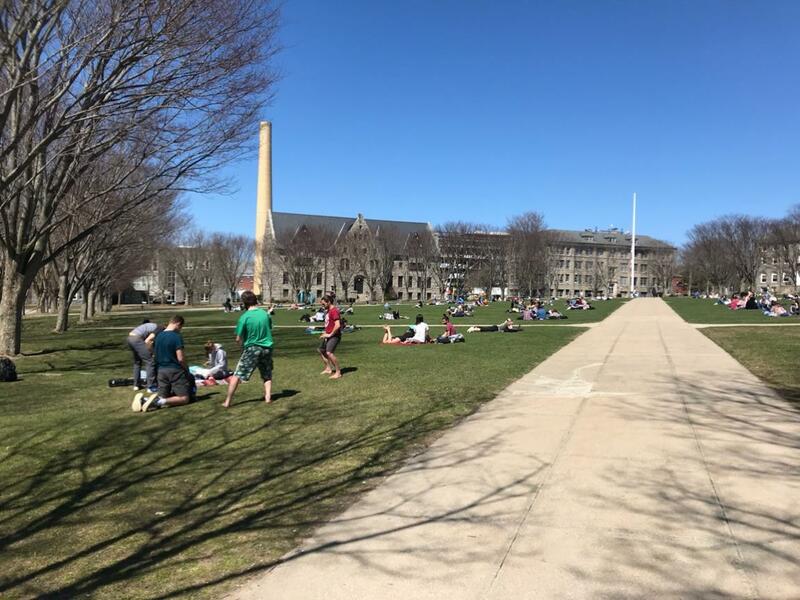 The University of Rhode Island has been hosting plogging events, which involves running and picking up trash around campus. “You don’t have to prepare for it, go for a walk or run and bring a bag along,” said Jennifer Luther, coordinator of marketing and membership with campus recreation. Coordinating with the a sustainability group at URI, compostable bags were provided. Working together with Denise Robbin, fitness and wellness specialist for Campus Recreation, what started as a story on the Huffington Post finally became a reality at URI. “It’s been exciting. When I presented it to my staff they immediately embraced it,” said Robbin. Supported by the community and her staff members, Luther and Robbin launched the environmental initiative to clean up campus. “Take pride in your community,” said Luther. This campus is made up of a diverse community. Ranging from students and faculty, to a plethora of plants and animals, every piece is part of a larger ecosystem. By pitching in, the campus can be kept clean and the animal’s habitat protected. Honoring the planet in time for Earth Day, the campus clean up spans from April 16 to the 25th, but plogging may continue indefinitely. As an incentive, students may post their trash pick-ups using #ploggingURI or #uricampusrec and potentially win prizes such as gear. 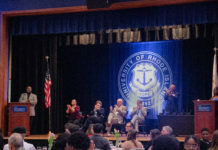 This movement is sponsored by the URI Office of Sustainability, URI Department of Recycling and Facility Services, as well as URI’s Department of Campus Recreation. “I already do [plogging], I didn’t know there was a name for it,” said Luther. Stemming from Sweden, the trend to pick up trash while walking or jogging, plogging, has spread like wildfire on an international level. Active citizens fed up with finding trash along their routes have taken the initiative to pick up trash. Plogging comes from the Swedish word “plocka upp,” meaning pick up. Luther wants everyone to know that everyone can make a difference by simply picking up the trash seen around campus. Failure to pick up trash results in it washing into local bodies of water and harming animals. The environment is their natural habitat, thus when debris is littered, it’s trashing animals’ homes. Plogging not only benefits the planet but it’s good for people’s health too. A Swedish app called Lifesum has made it possible for ploggers to figure out the amount of calories they burn while plogging. It was found that 30 minutes of jogging and plogging burned 288 calories, while simply jogging only burns 235. “We have been actively promoting plogging at the gym,” said Robbin. Domestically, the organization Keep America Beautiful, initially promoted plogging. Their primary objective is to encourage trash free communities. The idea here is everyone may be a part of office cleaning perth, taking responsibility and minimizing the impact on the planet. Anyone is able to participate in these plogging efforts. Kindly, give a hoot and don’t pollute. Bags and gloves are provided and can be picked up at the Anna Fascitelli Welcome Center and the Mackal Field House. Bags filled up with trash may be dropped off at trash and recycle bins added around campus like in front of the gyms and library.